Foolproof techniques, developed and perfected by designer Donna Druchunas, are the key to handknit socks that fit well and look great. Take precise measurements -- good fit depends on ankle and foot circumference -- adjust for stretchiness, choose the correct needles, and have fun with sock yarns! These are the elements that add up to socks you'll love to wear yourself or give as gifts. 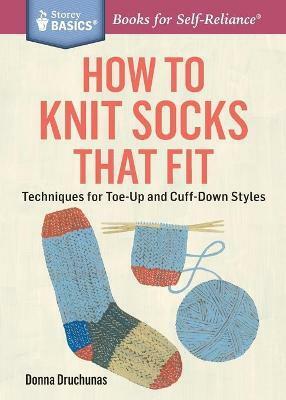 With chapters on cuff-down and toe-up methods and information on heel and toe variations, this is the handy little resource every avid sock knitter will love. Donna Druchunas, author of How to Knit Socks That Fit, is the author of six knitting books, including Arctic Lace, Successful Lace Knitting, Kitty Knits, and Ethnic Knitting Exploration. She teaches knitting workshops in the United States, Canada, and Europe and has three online sock-knitting classes with more than 25,000 students on Craftsy. She lives in Vermont with her husband, mother, and three cats, who all help her test the usability and comfort of her finished knitted items.